Homo habilis, as depicted and described in 6th grade California textbook History Alive! The Ancient World, pg. 16-17. Homo habilis was given this name because, “One set of [Homo habilis] fossils…was found with tools made of stone and bone,” so Homo habilis was assumed to have possessed the ability to make these tools, an important step forward in the evolution toward ‘humanness.’1 But was Homo habilis really handy…or even a man? 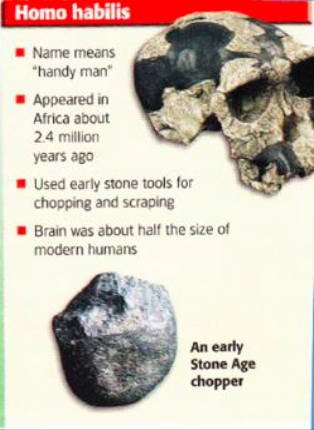 First, the textbooks do not clearly present the fact that serious scientific disagreement exists about what the fossils of Homo habilis actually represent. Some scientists believe that he belongs in the genus Homo, the same as modern humans, because of his supposedly human features (i.e. larger brain than ‘Lucy’). Not all scientists agree, however. Description of Homo habilis from pg. 30 of the 6th grade Ancient Civilizations textbook by Holt. Yet even this reason for admitting the ‘handy man’ into the human family has been challenged. Homo habilis is known to have possessed long arms and curved fingers, unlike modern humans, but typical of arboreal (tree-dwelling) creatures, like apes.3 This is why the recent discovery of a modern-looking human finger bone in the same layer with the stone tools and the original Homo habilis fossils (dated at 1.8 million years old) is causing a stir in the evolutionary community. 1Miller, Kenneth R., and Joseph S. Levine. Miller & Levine Biology. Boston, MA: Pearson, 2006. 499. Print. 2Miksch, Joe. “Researcher Argues That There’s More to the Genus Homo than We May Think.” Phys.org. Science X Network, 28 Aug. 2015. Web. 05 Sept. 2015. <http://phys.org/news/2015-08-genus-homo.html#jCp>. 4Dailymail.com, Ellie Zolfagharifard For. “The 1.85 Million-year-old Little Finger Bone That Could Rewrite Human Evolution: Find Suggests Previously Unknown ‘giant’ Ancestors That May Have Used Tools.” Mail Online. Associated Newspapers, 19 Aug. 2015. Web. 05 Sept. 2015. This entry was posted in Human Evolution on November 4, 2015 by cl311064769.